It has been more than seven years since the tragic but heroic death of Gen. Custer and his brave band on the Little Big Horn River. The remembrance of that dire­ful day brings a tear to almost every eye, and such heart­aches to the friends of the two hundred and forty-six heroes who lay down in death together upon the wild hill­sides of a remote country. The story of how they died, fighting like the Lacedaemonians, has been told a thousand times, but never by a survivor, for of all those who stood like a rampart about their commander, not one lived through the savage hail-storm of bullets and arrows; they left their bleeding corpses, piled one upon another, with faces always toward the foe, and thus made their sacrifice complete, hallowing a spot fit for the yew tree's shade. History after history has been compiled, and commissioners have visited the battle ground to secure reliable facts concerning the fight. A court of investiga­tion was held to examine charges preferred against Major Reno, for whose coming and assistance Gen. Custer looked so anxiously on the fatal day. But with all these efforts many important facts were necessarily omitted from all histories and reports, because they could not be gathered from inferences. 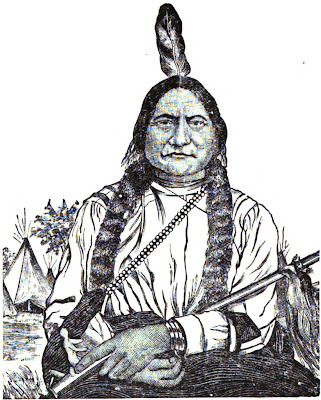 Applications have been time and again made to the In­dians who participated in the fight, for particulars of the battle, but by Sitting Bull's advice they all refused to talk on the subject, believing that any admissions regard­ing the fight would incriminate themselves and lead to their condign punishment. I have striven hard to procure re­liable incidents of the massacre, seeking all sources, and beyond what is recorded in previous editions of this work failed to receive anything of additional interest until the occasion which I am now about to report. After some correspondence with Buffalo Bill, several government interpreters, and commanders at various posts in the West, I decided to visit Ft. Yates—Standing Rock Agency—where Sitting Bull and his tribe are stationed, and make a last endeavor to learn how Custer died. This visit was made in August (1883) and so well did my en­terprise succeed that I have deemed the information then gathered of sufficient importance to add it as an appendix to “Heroes of the Plains." My route to Ft. Yates was by the way of the Northern Pacific R. R. to Bismarck, Dakota, and thence by stage, sixty-six miles south, where I crossed the Missouri River in a skiff late in the evening and took lodgings with the store-keeper, Mr. Douglass. Ft. Yates is a considerable post so far as houses are concerned, but the force sta­tioned there consists of only two hundred and fifty men, these being portions of the Seventh Cavalry and Seventeenth Infantry. The reservation extends up and down the river forty miles, on which there are estimated to be seven thousand Sioux, all of whom, except those since born, composed the body that massacred Custer. Sitting Bull is, of course, the central figure of his tribe, but there are many other chiefs whose valor far transcends that with which he is credited, such as Rain-in-the-Face, Low-Dog, Gall, and Crow King, who fought Custer with such fatal results. True democracy flourishes only with the Indians; the chiefs are chosen for their wisdom, by bands, and these bands are great or small according to the chief's popular­ity; thus, an Indian may be chief of a band of twenty, or of two hundred, for every Indian has the right to forsake his chief and become a member of another band. It often occurs that a chief is entirely abandoned, and then he becomes, practically, "a private in the rear ranks." 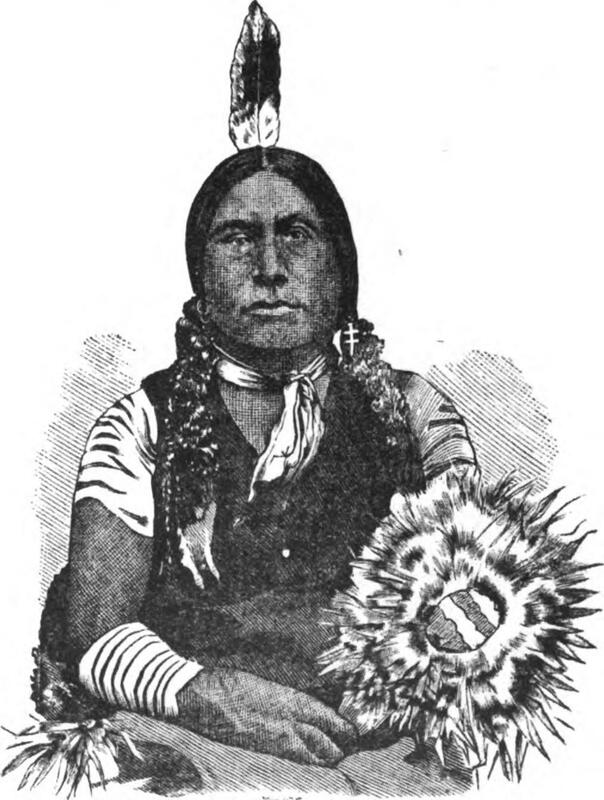 Sitting Bull is not a chief in the sense the term is used, but is a Moses among his people; he has almost unlim­ited influence among all the tribe, whether chiefs or bucks; some have pronounced him a medicine man, but this he disclaims, for he is too cunning to be subjected to a daily manifestation of his power. He claims to be a prophet; that he is in direct communion with the Great Spirit, who visits his teepee and talks with him face to face; and not only talks, but smokes his pipe and makes himself otherwise familiar. The career of Sitting Bull, or that for which he has credit, is eventful, if not remarkable, especially that por­tion since 1875. His war with the government opened in the spring of that year. Various depredations in the neighborhood of Fort Buford, on the Missouri River, were charged to him, but he denied them. Some settlers began measures of retaliation, when the prophet became greatly enraged, and, gathering about him a strong band, refused to live on a reservation, and went into camp on the Yellowstone. Then followed his siege of Fort Pease, when five hundred Indians endeavored for three months to capture the place and its defenders, forty-seven white men in all. A regiment of cavalry and some friendly Indians were sent to the relief of the garrison, but Sit­ting Bull withdrew at their approach, and us soon as the troops escorted the besieged away he returned and burned the fort. War was then declared against him, and, fail­ing to surrender within the ten days allowed, Generals Crook, Terry and Gibbon started after him in different directions. He checked the advance of General Crook by engaging his troops, slaughtered General Custer and all his band in an ambush on June 25th, 1876, and effected an escape to Canada, where he lived, under the sur­veillance of Major Walsh, of the British Mounted Police, until the year 1880. On Monday, June 14th, a body of Sitting Bull's tribe, to the number of five hundred, came down from the British territory, and, crossing the Yellowstone, surren­dered to Gen. Miles at Ft. Keogh. A smaller party had surrendered to Gen. Miles in 1877, but this was because of his active campaign in which the Indians were pursued so closely that they were unable to cross the British line. Sitting Bull, and about two hundred of his followers, surrendered on the 20th of June, together with their arms and ponies, to Major Brotherton at Ft. Buford. He was forced to take this course to save himself and people from starvation. They found the British climate too severe, while the game of that region was so scarce that they could not sustain themselves. The cavalcade, as it entered the fort, attracted much attention. It consisted of six army wagons loaded with squaws and children, fol­lowed by thirty of Louis Legare's Red River carts well-filled with baggage. Sitting Bull himself and his chiefs rode their ponies, and refused to dismount or shake hands until they arrived at the place fixed upon for their camp. Immediately after the surrender, the Indians were placed between the Post and the steamboat landing and there re­mained secure in Maj. Brotherton's charge until a few months after, when they were transferred to Standing Rock Agency. On the evening of my arrival at Ft. Yates I made the acquaintance of several officers at the club room, among whom was Capt. McDougal of the 7th Cavalry, who was with Maj. Benteen at the time of the Custer massacre, and who, with his commanding officer, attacked the Indians so savagely that Sitting Bull was compelled to retreat. I also met Lieutenant Brennen, of the Seventeenth Infan­try, also Captain Greene, Captain Howes, Colonel Stewart and others. Announcing to them the object of my visit, they volunteered their services to make my trip a success­ful one. On the following morning I was introduced to Mrs. McLoughlin, wife of Major McLoughlin the Indian agent. This excellent lady is official interpreter for the govern­ment, and her influence with the Indians at the post is almost equal to that of Sitting Bull himself. Her servi­ces to me were invaluable, of which I shall speak here­after. Shortly before noon a government team was placed at my disposal, with a driver, and accompanied by Captain McDougal and Lieut. Brennen, I drove down to Sitting Bull's camp, one mile south of the Fort. Upon reach­ing the tepees we learned of a funeral which was then taking place, the body being that of Sitting Bull's nephew, sixteen years old, who had died the day previous of a lung trouble contracted while he was attending school in the southern part of the territory. This opportunity I could not forego, so at my solicitation we drove over the hills two miles or more, and came upon the funeral pro­cession, if such it can be called, just as the body was be­ing deposited. It is the custom of the Sioux to hang their dead up on the branches of trees, when in a wooded country, but when their camp is on the prairie they erect scaffolds about ten feet in height, upon the top of which their dead are laid. The corpse of Sitting Bull's nephew had been prepared for deposition the evening previous to my visit, this prep­aration consisting in swathing the body with all the cloth­ing owned by the deceased, including the allowance shortly before made him by the government, and around these were two blankets, the whole being bound with ropes, so that no part of the body was left uncovered. Lamentations were then made over the corpse all night, not, as might be supposed, by the relations, but by four old women who were engaged to do all the crying. It is a rare thing to see an Indian crying, as it is esteemed dis­graceful, so there are professional mourners who engage themselves to display the grief supposed to be felt by the friends and relatives of deceased persons. Frequently, when there is extreme grief over a death, the distressed persons will cut off a finger or toe as an evidence of their feelings. Bodies are taken to the place of final deposit by tying them on a travois, with head toward the ground. It. was thus the body we followed was conveyed to the scaffold, made ready to receive it three weeks before, when his father died and was deposited on a scaffold large enough to receive another corpse. The procession, so-called, consisted of four old women and their children, the professional mourners previously spoken of. Indian men never attend a funeral unless it is that of a chief. We arrived at the scaffold in time to see the women make a temporary ladder up which they climbed and carried the body, with extreme difficulty, and deposited it beside the remains which already lay there. I saw no other scaffold on which there was more than one body. After the deposition was made, the women threw their arms about, tossed their hair and crooned a kind of dirge which had neither time nor melody to distinguish it from an unrythmic wail; after crying thus for a time they fell to stamping the ground and digging with a short crow-bar. We had witnessed these sights from a dis­tance, being unwilling to intrude upon so sacred an occa­sion; as we drove up the lamentations suddenly ceased and gave place to stares of curiosity. One of the old women, engaged as mourner, told us she had been em­ployed to cry so much recently that she could scarcely see. The rheumy appearance of her eyes certainly confirmed this declaration. Shortly after our departure the old women returned to the camp and were succeeded by four others. The mourning was thus continued, by relays of women, for a period of three days. The dura­tion of such manifestations of grief is generally deter­mined by the number of ponies left by deceased to pay for the service. After leaving the cemetery we drove back to Sitting Bull's lodge, and being introduced I conducted a long conversation with him through Charles McLoughlin, a young son of the Indian agent, as Sitting Bull can scarcely speak a word of English, though he signs his name fairly well—as is seen in his autograph. I was not in the fight and know nothing about it, save what my warriors have told me." I need not tell you how we have been deceived by the white people, for if you are friendly you know the facts, and if you are our enemy you would not believe me. The Black Hills country was set aside for us by the government; it was ours by solemn agreement, and we made the country our home; we realized how our lands had been taken, our reservations circumscribed my people driven like so many wild beasts toward a common center to be shot down by encircling soldiery. Our homes in the Black Hills were invaded when gold was discovered there; we asked for protection, which was promised, but with all our importunities the government refused to come to our aid. White thieves committed depredations and then accused my people of perpetrating the acts. Well, it is no use to tell you more. At last we resisted, and that moment the poor despised Indian raised his arm to protect his wife, children and his own, the government to which we looked for the aid that had been promised, let loose the army upon us to kill without mercy, exterminate if possible. We fought as brave men fight, with no advantages but courage to defend against usurpers we met our enemies and honorably de­feated them. Now it is asked, why do I refuse to talk about our fight with Custer? You cannot wonder at my silence. Every man's rifle is leveled at the Indian's heart; every white man cries out, let us avenge Custer, and especial hatred is directed against Sitting Bull. I am afraid to trust myself away from my people. They have tempted me with large offers to travel in the States, but the cars would make me sick, and once wholly within their power, the white people would starve me to death, because they say I murdered Custer. Now I will tell you the truth, after our fight at Fort Pease my people concluded to leave our country and travel into the British Possessions, where we hoped to find plenty of game and have better protection. To prepare for this great journey and change, we held our annual Sun Dance, being our offering to the Great Spirit. It is our belief that we can only come into the presence of the Great Spirit through sufferings of the flesh, but though the ceremony indicates pain to those who partici­pate, yet there is really no suffering when there is an acceptance. At the conclusion of the third day of our dance I became unconscious of my material surroundings and was awakened in the spirit before the Great Ruler. He smoked and then gave to me the peace pipe; we were seated together in a beautiful tepee, and after smoking, he said to me, Tatanka-e-Yotonka, you are being sur­rounded by your enemies; in seven suns you will be attacked by your ancient foe, the Crow Indians, but over these I will give you a victory; three more suns shall not set before your people will have an engagement with white soldiers; the fight will be a terrible one, but your enemies will be slaughtered and you shall have a great victory. This prophecy you can make to your people, for they are weary and this will give them courage. After thus speaking the Great Spirit vanished and sometime during the night I recovered consciousness. I prophesied to my people as the Great Spirit directed, and that it came to pass as I uttered my people are the witnesses. "The Crow Indians attacked us, but were repulsed with heavy losses, so that they molested us no more. On the seventh day thereafter, as we were encamped near the Rose Bud, a body of soldiers appeared who, I have since learned, were commanded by Maj. Reno. They fired into us, but being prepared we charged upon them so briskly that the troops fled in such a panic that many lost their arms, and a large number were killed. We did not follow them for fear of an ambush, as I could not under­stand why Reno did not make a stand. We drew off and in the afternoon my scouts reported another body of soldiers approaching. After learning their probable strength I directed my warriors to form in the ravines so as to be out of view, and leave a horse-shoe gap so as to surround the troops when they should enter. My position was across the river from where the battle occurred, as I took it upon myself to direct the fight and also take charge of the camp. My orders were de­livered by courier to Spotted Eagle, Rain-in-the-Face, Crow Bing, Low Dog, and Gall, and these chiefs participated in the battle. "The troops discovered my warriors before the gap was closed upon them, and with a wild yell they charged right down a ravine toward our camp, but upon coming up on the other side the circle was completed about them, and the battle began. Now, I witnessed little of the fight myself, but was kept informed of its progress. The firing was terrific, and though the soldiers fought with desperation my braves were better fighters than they. The combat lasted I cannot tell how long, as we do not compute time like the white people, but I should judge not longer than it would require me to walk to the fort and return (two miles). The firing gradually grew less and when it had almost ceased a messenger came and told me that all the soldiers had been killed. As I started toward the battle-ground I saw five of my braves chasing a soldier over the hills. They were on horses and all running with great speed. I watched them until they had disappeared in the distance. 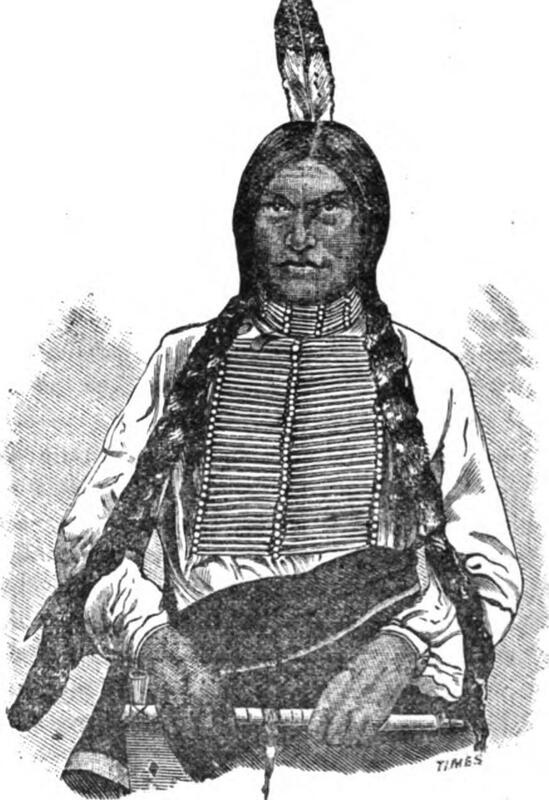 The pursuers, who were braves of my tribe, returned sometime after and reported that they had been pursuing an officer, who being well mounted would certainly have es­caped, but that just as they were about giving over the chase, the officer drew a pistol and placing it against his head blew his brains out. The pursuers brought back with them a portion of the suicide's clothing. My braves, who had won the battle, collected what material, arms, ammunition, clothing and money they could find on the battle-ground, and then started northward. Up to this time I did not know we had been fighting Gen. Custer, and nothing ever surprised me more than the report which came to me a long time after the battle, that my warriors had killed Custer. We knew that the General wore long hair, and it was by this peculiarity we expected to distinguish him. Since the return of my people to Fort Yates I learn that Custer's coat of buckskin was stripped from the dead body of the General by one of my braves who afterward wore it until his death, and was buried in it. I did not learn this, however, until after the death of the brave. "On the night after the battle our tents were struck and we started northward, expecting an attack on the fol­lowing day. My warriors were very tired, and had the pursuit been an active one we would, no doubt, have been overcome. Had not Maj. Benteen joined forces with Maj. Reno when we had the latter surrounded in the woods, there would have been few soldiers left in the three commands to tell the story of their disaster. "No one can tell who killed Gen. Custer, it is impos­sible because of two facts: (1) None of my braves knew Custer, and (2) the tumult and smoke of the bat­tle were so great that combatants were often obscured en­tirely, and the fighting was therefore promiscuous. None of my people. ever boasted to me that they had killed Custer. "I have now told you all that I know in regard to the fight with Custer. I can't see why the white people hold me responsible for his death; the soldiers attacked us and we fought to defend ourselves. If all my people had been slaughtered the whites would have been glad. I am now at peace, however, and do not want to speak ill of the government. I hope our peace may endure. I have only one ambition now, and that is to live the re­mainder of my days with my children and people. I feel that my life will not long endure: a lung trouble has afflicted me for more than a year, and seems to grow gradually worse. Many offers have been made me to travel through the country and show myself, but no in­ducements could prevail. I never rode on the cars and fear such travel would make me sick; besides, I would not trust myself with the whites, who would starve me. My delight is to have my children with me every day, and here among my people will I die." This closed my interview with the wily warrior, and though short, it was far more satisfactory than I had dared to hope for. Sitting Bull impresses all who see him with his genius, not particularly as a warrior but as a states­man or tactician. He has a noble, kindly face, and an eye that discloses his trait of acute observation. His stature is tall and commanding, broad of chest and strong in limb. He declared his age as forty-four, but as In­dians, as a rule, cannot compute time, his statement does not appear willfully absurd; I should judge his age to be about sixty-five. 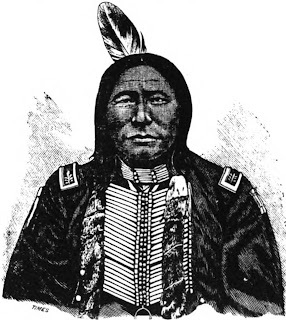 The story which Sitting Bull tells of an officer who was pursued and who shot himself to escape capture is authen­ticated by a discovery made by Gen. Sherman two or three years ago, when on a visit to the battle ground. Six or seven miles from the field of disaster, the General with his party, came upon the skeleton of a man with remnants of officer's clothing still adhering to it. An examination of the skull disclosed gold filling in several of the teeth, and served to identify the skeleton as that of Lieutenant Harrington, of the 7th U. S. Cavalry, who was with Custer. Among the Sioux Indians there is a squaw, La­kotah by name, the wife of chief Spotted Horn Bull (Tatanka-ha-gle-ska ), who by her bravery and intelli­gence, has risen to a position of influence among the tribe far superior to that of her husband, and second only to Sitting Bull himself. A short time before my visit to Ft. Yates this dusky Amazon had a combat with the great warrior chief Gall, who so distinguished himself in the Custer fight. Report states that Gall bad attempted to form a matrimonial alliance with an Indian girl regardless of the fact that his wife was still sharing his tepee and the government allowances with him. Gall's wife is a cousin of Mrs. Spotted Horn Bull, and she took such um­brage at him for trying to displace her relative that, setting aside all attempts to reason or compromise, she challenged the chief to an encounter; the challenged failed to afford her satisfaction, so she forced a fight by attack­ing Gall in front of Mr. Douglass' Government store. The scene which followed is represented as having been exciting in the extreme. Gall first acted entirely on the defensive, but he soon became aggressive only to bring upon himself a distressing defeat, for the heroic squaw beat him so badly that, after his features were chewed out of shape, he howled for mercy, and to escape further punishment gladly promised to restore his wife and for­ever after abandon reckless courtships. "I will leave it to others to tell you of the wrongs done my people by the Government and its soldiers. 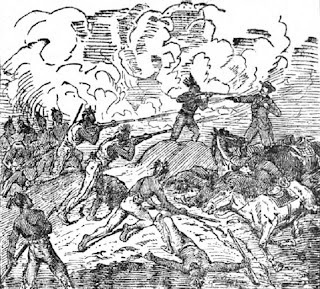 The Custer Massacre was a consequence of this treatment, and if it teaches the father at Washington to do us justice hereafter I shall be glad, but I now fear that instead of serving to improve our miserable condition it will cause the soldiers to seek revenge by increasing the severities from which we suffer. But I will now only talk to you about our fight with Custer. "Eleven days before the battle we were encamped with­in fifty miles of the place where the engagement took place, on a small creek: called Greasy Grass; I do not know the English name for it. In this place our people held a religious ceremony, our Sun Dance, to show the Great Spirit that our hearts were always toward him and to ask for His protection. Among the number who bore the tortures of that ceremony, by piercing the muscles of his breast and thus suspending himself from the pole, was Sitting Bull. There were six other chiefs who cut themselves and were hound to the pole, but they all fainted or broke their bonds the first day. 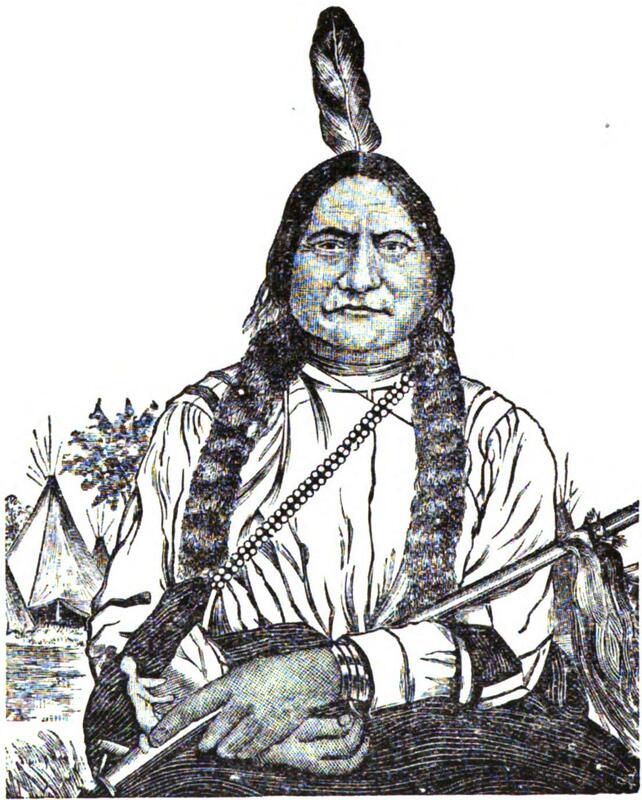 Sitting Bull remained in one attitude for two days, looking always toward the sun, and never showing any signs of suffering or weakness from loss of blood. In all this time he tasted neither food nor water, but the third morning he went into a sleep and we knew he was holding a council with the Great Spirit. I forced food and water into his mouth, bathed his wounds and watched beside him until night, when he opened his eyes and then told how he had been counseled to act by the Great Spirit; he also prophesied a battle with the Crow Indians, and with Custer (at this point she related the same story told to me by Long Soldier, which I have given in the chapter devoted to Sitting Bull's account of the bat­tle). "Two days after the Sun Dance was concluded, and according to Sitting Bull's prophecy, a large war party of Crows attacked us, but after fighting all day they wore driven off into the Wolf Mountains, several of their warriors being killed; our loss was only seven. "On the morning after the battle with the Crows, we broke camp and moved on to the Little Big Horn, where, finding plenty of water and grass, we went into camp again. "To make my story more readily understood—for I shall now begin to tell you about the great battle which here took place between my people and Gen. Custer—I will draw a diagram of our camps and the general posi­tion we occupied when the fight began." At this point Lakotah called for my pencil, and being given a piece of paper she made the following drawing, in the execution of which I was very much surprised.
" The total fighting force of the seven tribes was about five thousand, and all of these were first camped on the west side of the river, where the ground is nearly level, except at a little distance back where the ground rises in a bench six or seven feet high. On the east side of the river, however, the land is broken and hilly, while along the bank there are precipitous bluffs, the highest being marked on the diagram ‘K’. Reno threw up his shallow breastworks at ‘G’at which point the land is two hun­dred feet above the river, rising very abruptly. It was front this side of the river and over these hills the United States soldiers approached.
" 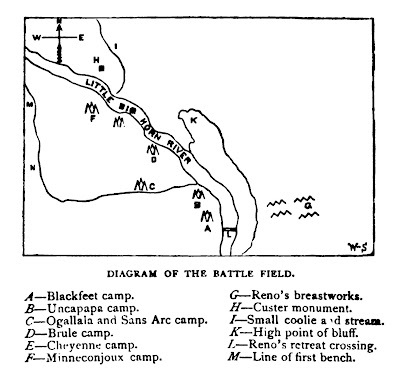 It was to the bluff point marked ‘K' that captains Benteen and Wier rode to discover the position of Gen. Custer, but being unable to sight him, and seeing the large Indian camp, they fell back to support Reno. In the meantime, however, Reno had crossed the river—which was anywhere easily forded—at ‘L,' and attacked the Indians in the rear. This was on the morning of June 25th. On this same date seven Cheyennes had been sent out to join Chief Spotted Tail; five of this number got through, but the other two stopped on the bluff and from a high point signaled with their blankets the approach of a large body of soldiers, which afterward proved to be Custer. When Reno opened fire from the west bank, he seemed to have little or no idea of the number of Indians to whom he was opposed. He dismounted his men, and leaving one man to guard four horses, which of course diminished his fighting forces one quarter, he rushed onto the camp. It happened that very few warriors were in camp at the time, as more than half of them were after the pony herd, so that with the first fire there was a panic among the women and children that I cannot undertake to describe. 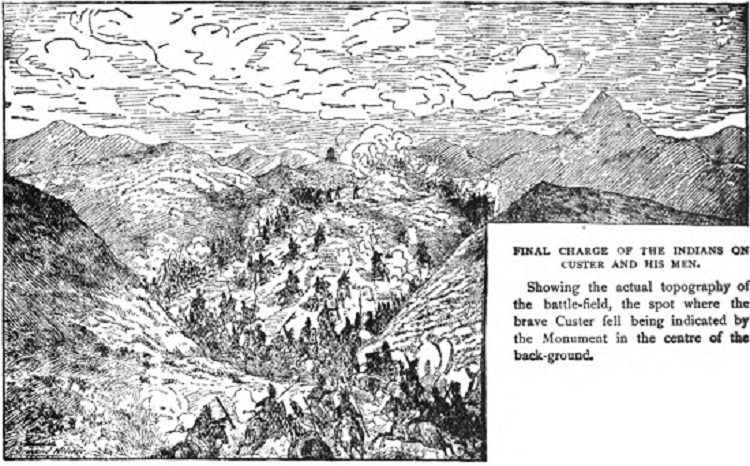 We all expected to be massacred, and there was not the least resistance manifested, when suddenly, and for a most unaccountable reason, Reno's men became panic-strikers and retreated back across the river in such wild disorder that scores were killed by our men; even little boys followed in the rout and pulled soldiers from their horses and killed them. After crossing the river the retreat continued up a hill so steep that unless badly frightened a man could scarcely climb it. 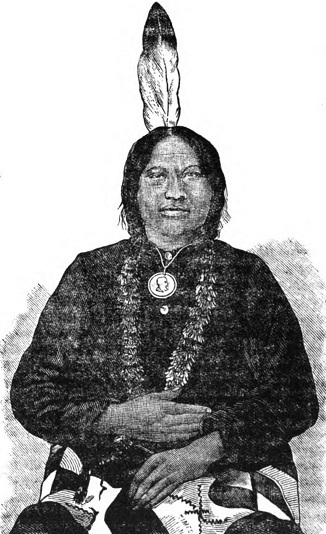 Lakotah several times repeated her disgust at the action of the whites, and the only explanation she could give for the retreat was that Reno saw, when he got into it, how large the Indian village was and was seized with a panic greater than that among the Indians themselves. That the latter was very decided, however, was proven by the fact that the warriors hurriedly returning with the quick­ly rounded herds met many fugitives from the camp and feared the worst on their own return. “Very soon after Reno's retreat the blare of Custer's trumpets was heard; messengers soon reported his prob­able force and the work of surprise and hemming him in was begun. The braves who were after the pony herd had now returned and the whole fighting force crossed Little Big Horn and, being hidden by the hills, surround­ed Custer before he was probably aware that there were so many Indians in the vicinity. When the whites had marched under the high ledge of rocks, suddenly our force of five thousand rose up and fell upon them on every 'side. The whites first dismounted and fought, but seeing how they had been surrounded, and that there was little hope for their escape, they remounted again. For nearly half an hour the fight was terrible, as our braves were all as well armed as the soldiers. The valley be­came so full of smoke that it was like a dense fog, and the noise and confusion was dreadful. After that time there was a gradual cessation of the firing and in less than an hour we had killed every soldier and the battle­ground was left to us. Custer and his command killed, the Sioux again turned their attention to the troops on the hill, and the woman, resuming the story, laughed gleefully as she told what fun the bucks had shooting at the soldiers as they ran that terrible gauntlet, down the hill to the river, for wa­ter. The Custer men were soon stripped, of course, and the only way the Indians knew they had killed the Long-Haired Chief was by his buckskin coat trimmed with beaver, which they found on his person. Lakotah says the Sioux lost thirty killed and more than twice as many wounded, but the loss was no doubt very much greater than this estimate. Among the killed were boys of twelve and fourteen, who, in the ardor of young warrior-hood, rushed across the river on their ponies and into the thickest of the fight. She mentioned two boys who were wounded; one, a young Achilles, in the heel, and another in the right arm, which was shot off. Both recovered and neither of them is yet twenty, though seven years have passed since they counted their first coups. It was with a tone of most noticeable regret that the woman told of the quantities of bank notes found and wasted, as being utterly ignorant of the value of the curiously painted parallelograms of green paper. Of course, feasting and laudation were the order of the day and night succeeding the slaughter, but the news of Terry's approach with his command compelled a hasty breaking up of the camp. She says they marched day and night for several days, and soon the whole band was safe in the fastnesses of the Big Horn mountains, where they remained some time before a separation took place, and the Uncapapas and portions of other tribes went north. The squaw's story was told straightforwardly and beyond question she believes it true, every word. Among the many brave and noble-hearted men who fell with Gen. Custer were his two younger brothers. Boston and Tom Custer, Lieutenant James Calhoun, his brother-in-law, and Autie Reed, a young hero, his nephew; all these dropped out at once, as it were, from the family circle. Every man in Calhoun's company died in the ranks; there was no scattering to indicate either panic or retreat, but with the ranks all closed up the company fell as though every man had been struck with one fatal bolt of lightning. Lieut. John J. Crit­tenden, Col. Cook, Capt. Yates, Lieut. Riley, in short every one of those who participated and fell in that dreadful fray were as gallant men as ever went forth to battle or lay life upon the sacrificial altar of their country. Though mangled by bullet and arrow, dis-crowned by the savage scalping-knife, divested of their country's uniform which would have been most fitting cerements for such patriotic heroes, let us believe that at the final roll-call these evidences of Indian desecration will prove their passport into the highest holiest life. From Heroes of the Plains, 1891 – by James William Buell.